I’ve asked my mother to write about anything related to Japanese food. She was born and raised in a small town just south of Nagoya, back in the 40s to 70s. Back in her days, the town was all rice fields and farm plots with small traditional Japanese wooden houses. Nowadays, it’s become more like a suburb of Nagoya. The aroma of miso soup always reminds me of the “wake up” call from my mother. It meant that breakfast was ready. When I was small, breakfast was mainly miso soup and rice. She made soup stock from small dried sardines, and sometimes, she left them in the soup. Although this is actually good for the bones because of the calcium, I hated it. Sometimes, she made the soup stock with dried bonito flakes, which tasted much better even if she didn’t take them out and left them floating in the soup. The ingredients of miso are mainly boiled or steamed soybeans, yeast and salt. Komemiso is fermented rice which is added to soybeans. Mugimiso is with fermented barley. My grandmother used to make Mugimiso. Miso is classified by two colors, red and white. Red miso is a very dark brownish colour while white miso is a pale “dirty” yellow. There is one more type of miso which is mixed. The colour differs according to the portions of red and white miso. If you talk about miso in my home town, it is red. White miso tastes milder than red miso. If you grew up with white miso, you will most likely be offended by the colour and strong flavor of red miso. Before supermarkets existed in my hometown, we bought miso at a special store which produced Miso and Soya sauce. Ready made mixed miso was available at the store, but my mother preferred to mix red and white Miso to her own taste. Nowadays, making homemade soup stock is not so popular. There are all kinds of instant soup stock which can be added to boiled water and there is also miso which already contains soup stock. I make miso soup whenever I cook rice. I buy only white miso here in Canada. I think that is why I can’t get the same aroma and flavor from my childhood. But Miso soup is still Miso soup, so it’s better than nothing. 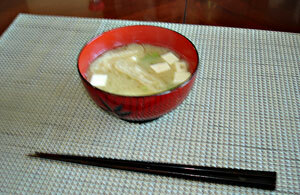 In miso soup, usually there is Tofu (bean curd) or seaweed with greens such as green onion or snow peas for colour. We say it is not elegant if you add a lot of stuff in the miso soup because if you’re rich, you can get nutrients from the other dishes in your meal. But if you’re poor, you can’t afford other dishes so the only way to get nutrients from your meal is by adding a lot of stuff to the miso soup. Each family has their own recipe for Miso soup. My recipe is Age (fried bean curd) with my Miso soup. I will add one or two kinds of seasonal vegetables as well. When it’s winter, I make Buta jiru (sliced pork in the Miso soup). It has a lot of root or leafy vegetables, Tofu and thinly sliced pork. I usually use pork belly, because it makes me feel better to see a little fat floating on the surface of the soup, as well as the flavours of all the vegetable. If you add a pinch of chili powder into your Buta Jiru, it will warm your body up. It can be also main dish,accompanied by a bowl of rice. Theses days, many kinds of instant miso soup are sold at the Asian supermarket. Thanks to technology, they taste much better than before. When I go to camping, I always bring instant miso soup. It is so easy. That way, miso soup is ready anytime you have hot water. I absolutely love miso soup. There are a few places around here in Atlanta where it’s at least pretty good.